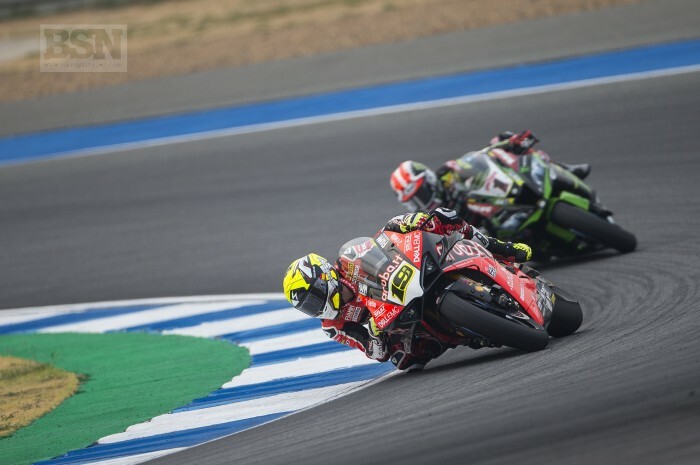 Aruba Ducati’s Alvaro Bautista took victory in the Buriram WorldSBK sprint race today after it was red-flagged due to a crash involving Leon Camier and local man Thitipong Warokorn. Bautista, who said he made a huge setup change to the bike in warm-up, made a break at half distance and took a second out of reigning champion Jonathan Rea before the race was stopped and result called as 50 per cent had run. Alex Lowes bagged his second podium in a row on the Pata Yamaha. Lowes headed up his team-mate Michael van der Mark with Leon Haslam (Kawasaki Racing Team) in fifth place, winning a battle he did not know would be the last one at that stage, from Marco Melandri (GRT Yamaha) and Sandro Cortese (GRT Yamaha). Still struggling by his own high standards, Chaz Davies (Aruba Ducati) was eighth, Toprak Razgatlioglu (Turkish Puccetti Racing) ninth and Tom Sykes (BMW Motorrad WorldSBK Team) tenth. Eugene Laverty wasn’t able to take part in the race as his bike is not yet re-built from yesterday’s crash. The final 20-lap race two will take place later this morning. Camier walked away from the incident but has been ruled unfit for race two with a knee sprain. Warokorn has gone to Buriram Hospital for further medical assessments with chest injury, head injury and concussion.